In today’s pop-culture, climate and zeitgeist nostalgia reigns supreme. From movies to music, the past has put a stranglehold on the public’s obsession with remembrance. At times it can feel overwhelming and even annoying at the amount of old content that is being refurbished into new content. However, taking a trip down memory lane is not always negative. In fact, there are many stories of the past that may have been glossed over and never told. For those who relished in the world of hip-hop music and skateboarding whether it be in the 1990s or the 2000s, the film Mid90s will be a welcomed addition back to the world of Nostalgia. 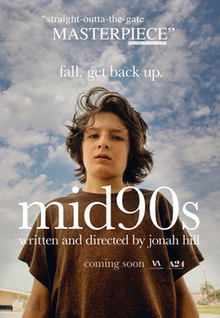 Mid90s was written and directed by Jonah Hill who would be making his directorial debut. Hill is best known for being in comedies such as 2007’s comedy classic Superbad, Get Him to the Greek and 21 Jump Street. However, Hill has also been a part of critically acclaimed films such as Martin Scorcese’s The Wolf of Wallstreet, 2011’s Moneyball and the Duplass’ brother’s comedy-drama Cyrus. According to Hill, Mid90s was inspired by films such as Kids (1995), The Sandlot (1993), Ratcatcher (1999) and This Is England (2006), which featured main characters that were children and teenagers. The film also draws some similarities to 2005’s Wassup Rockers that was directed by Kids director, Larry Clark. Wassup Rockers also featured a group of teenagers getting into all sorts of trouble in the Los Angeles area with a backdrop of skateboarding. Mid90s takes a more focused approach that follows the story through the eyes of one character. Mid90s follows 13-year old Stevie played by Sunny Suljic whose story arc in large part is about fitting in. Suljic is best known for his role in The Killing of a Sacred Deer. At first, it seems that Stevie wants to be accepted by his brother Ian played by Lucas Hedges. Stevie looks through his brother’s room in one scene that is filled with classic hip-hop posters and plenty of hip-hop memorabilia that will be familiar to any hip-hop fan specifically those who are familiar with the music of the era. At a dinner with Stevie’s brother and mother played by Katherine Waterson (Dabney), Stevie gives Ian a copy of The Pharcyde’s Labcabincalifornia album. This lets viewers who may have been skeptical of Hill directing a film that featured a vast majority of mid-90s hip-hop know that he is a fan and familiar with the genre at all levels of popularity. Hill’s goal was to frame hip-hop music as an important music genre. The film medium has had plenty of movies filled with hip-hop music; however, the music is treated as more of a fad or written off as something that only kids listen to. For those who lived and grew up in the 1990’s the same way The Beatles and Stevie Wonder were viewed as icons to past generations so too are artists such as Nas and the Wu-tang Clan. The film’s score is exceptional as well with Trent Reznor and Atticus Ross at the helm. The duo is best known for their work in the band Nine Inch Nails and has scored the film The Social Network. Throughout the film, viewers will hear some classic hip-hop tracks of the era that add to the movie's atmosphere. Mid90s does not have a specific year in which it takes place; instead, the film is more of a period piece for the 1990s. The movie was shot entirely on 16mm film in Los Angeles giving the film the look of a VHS film more so than the 4K and Ultra HD films of today. Hill stated that he was attempting to make a ‘reverse skate video’ that focused more on the people riding the skateboards versus the actual tricks they can do on them. The movie succeeds with this premise giving viewers a group of characters that many will be able to relate to regardless if they ever stepped foot on a skateboard. Stevie is first introduced to skateboarding when he rides his bike by a local skate shop, Motor Avenue Skate Shop and walks in to see a group of teenagers skating. He immediately becomes enamored with the skate shop and goes to the shop every day pretending to shop around while listening and watching the kids skate. Stevie at one point is able to trade some of his personal items for an old skateboard from his brother and immediately begins joining the group of skaters at the skate shop on their daily skate adventures to some different spots in the Los Angeles area. Stevie first forms a bond with Ruben played by Gio Galacia. Throughout the film, the viewer sees Stevie’s relationship with each character in the skate group change and evolve. Ruben, at first, is a mentor to Stevie showing him the ropes of skating with the group and a little insight into each one of them. Na-kel Smith plays the character of Ray who is the leader of the skate group. Smith is an actual professional skateboarder making his film debut. Smith did play himself in Cartoon Network’s Loiter Squad and Adidas’ Away Days in 2016 but this was his feature film debut. Ryder McLaughlin plays Fourth Grade who spends the majority of the movie filming all the group’s experiences and exploits. The final member of the group may be it’s most charismatic in Fuckshit played by Olan Prenatt. The explanation of how Fuckshit got his name is comical and indicative of the film capturing some of the nuances of being a kid in that time. Stevie’s family dynamic changes in the film once he becomes further ingrained in the skate group of friends. There are scenes where Stevie cleans himself before heading back home as not to smell sweaty or smell like smoke or alcohol. In one scene, Fuckshit confronts Stevie’s brother Ian when they randomly run into each other at a local restaurant. Ian sees Stevie sitting with the group of skaters; however, neither one of them say a word to another while Fuckshit continues to antagonize Ian aggressively. The viewing audience is given some perspective with Stevie’s home life with scenes of he and his brother stealing money from their mother or them playing video games together, but you don’t get to know his mother Dabney or brother extensively. The film takes its influences from the movie Kids when the group heads to a house party where they are conversing and spending time with a group of teenage girls. In one sequence, the film does a long one-shot take of Fuckshit heading to the refrigerator to grab some alcohol accompanied by Herbie Hancock’s classic “Watermelon Man.” This scene was one that felt like Hill was experimenting with this being his first film and seeing what would and would not work. At one point at the party, Stevie ends up striking a conversation with a girl at the party named Estee played by Alexa Demie. The two end up going into a room and having sexual relations. The film does not show any sexual acts between the two minors and Stevie is greeted with celebration when he returns to the group. When Stevie gets home from the party extremely intoxicated, he gets into a fight with Ian that ends with both having an emotional breakdown with Ian crying and Stevie attempting a form of suicide. Katherine Waterson has her most intense and explosive scene when she takes Stevie back to the skate shop to confront his group of friends. Waterson yells at the boys and forbids Stevie from hanging around them. Her performance during this portion of the film indicates that she is worried about her son, but more importantly, she is scared about losing her son as she is slowly losing a grip on her family. Needless to say, Stevie doesn’t take his mothers actions well and yells at her in the car after leaving the skate shop. When he returns to the shop and is sulking in the back while others are skating the film hits its high mark. Ray comes out to console Stevie giving him a different perspective letting him know that things could be much worse. He goes on to describe some of the issues each member of the skate group most telling about how his brother was killed in a car accident. While Mid90s on the surface seems like a film about skateboarding and hip-hop, the movie is really about friendships and the connections made as a youth. While skateboarding and hip-hop may have been the vessels that introduced Stevie to his crew of skaters, what kept them friends are the relationships they formed with one another. Hill even goes to the extent of showing a rite of passage for anyone who has ever skateboarded when they show Stevie finally landing an Ollie, the first trick any skater learns, at his home. Some of the best portions of the film lie in its cameos. Comedian Jerrod Carmichael plays a security guard at a school and has a hilarious back and forth with the crew of skaters. Skateboarding legend Chad Muska also makes a cameo appearance as a homeless man. Most notably Bay Area hip-hop legend Del the Funky Homosapien also plays a homeless character even having an extended conversation with Ray and Fuckshit. The film’s final act starts with the skate shop hosting a party. At the event, Ray attempts to befriend two professional skateboarders but is interrupted by a growing in jealousy Fuckshit who purposely sabotages the conversation while seemingly drunk. The tension between Ruben and Stevie comes to a head as they brawl during the party after they bump into one another. When the party is over, the crew jumps into Fuckshit’s car to head to another party. Ray begrudgingly gets into the car after telling everyone to go home from his disappointment of his friend’s behavior at the party. While driving Fuckshit becomes increasingly inattentive to the road eventually crashing the vehicle leaving Stevie unconscious. In many respects, the film’s third act proves to be a trope for tearing down the group to rebuild them back together. Stevie awakens in a hospital with his brother at his side. In one of the most touching moments of the film, Dabney (Stevie's Mother)walks into the hospital lobby to see that the group of skaters slept in the lobby overnight to make sure that Stevie was fine. In the eyes of Dabney, this moment changes her perception of Stevie’s friends from hooligans to people who care about him. The group of friends is asked if they want to see Stevie in his hospital room. In the room, the conclusion of the film commences with Fourth Grade putting on a skate video he made with everything he filmed throughout the movie. Fourth Grade’s movie just like Mid90s is more about friendships than skateboarding. With Mid90s, film studio A24 adds another coming of age film to its collection of quality movies. Mid90s falls within the same vein as The Florida Project, Moonlight, Lady Bird and Room bringing audiences new everyday stories that are rarely told. Jonah Hill’s first foray behind the camera proves to be successful in the mission he set out to achieve. The film won’t be nominated for Oscar’s, however; time will be on its side just like nostalgia. Mid90s proves to be a period piece for a generation of people whose story has not been told from their perspective. The story will be more relatable to those who love skateboarding and hip-hop, but the film tells a story that others will be able to relate to despite those caveats.